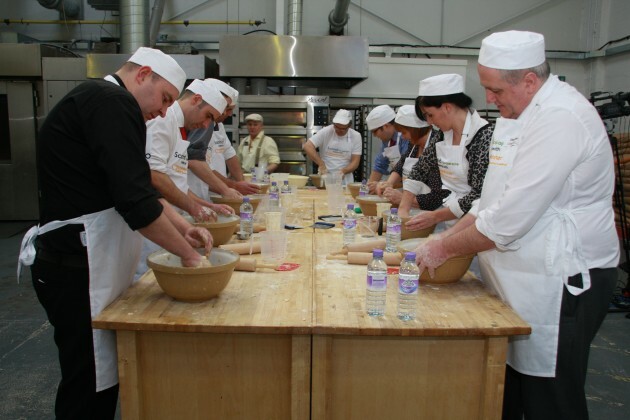 Store managers had the chance to try their hand at baking bread with Edinburgh’s Breadwinner Bakery recently, as part of Scotmid’s commitment to delivering a comprehensive range of bakery products from local suppliers within stores. Sean McVey, who is the master baker and owner of Breadwinner, led the course into the art of making hand crafted and artisan breads on 5 February 2013. The award winning bakery now supplies selected Scotmid stores with a full range of traditional breads on an exclusive basis. As part of the partnership, Breadwinner introduces three new breads every month, which have recently included Sunflower Rye, Pain de Campagne and a special Chocolate and Strawberry Brioche for Valentine’s Day.